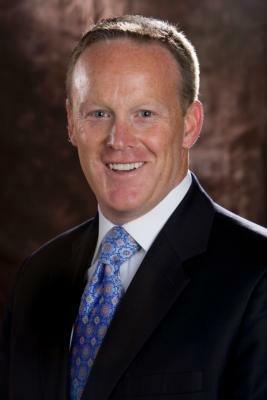 Sean M. Spicer is a seasoned communicator and strategist who has been combining his communications skills, creative sense, political savvy and issue knowledge to create, lead and implement successful public policy and issue campaign efforts for over fifteen years. He has a diverse and extensive background including senior positions on Capitol Hill and political campaigns, the top ranks of the administration and over a decade of military public affairs service. Sean, a founder and partner at Endeavour, has earned praise for his dynamic, creative and effective media events that have taken place on every continent, including 24 countries. Prior to joining Endeavour, Sean served as the Assistant United States Trade Representative (USTR) for Media and Public Affairs within the Executive Office of the President of the United States from July 2006 through January 2009. As a member of the senior executive service, Sean was the administration's point person for creating and implementing the domestic and international media strategy on trade issues. In his two and a half years at USTR, Sean logged over 440,000 miles of international travel that took him to 35 foreign cities. During his tenure at USTR he oversaw the media efforts involving trade agreements with Colombia, Peru, Panama, and South Korea. His strong relationships with outside stakeholders, editorial boards, and columnists resulted in numerous supportive columns and opinion pieces in influential publications. He also played a lead role in the messaging and strategy related to the Doha Round of multilateral trade talks; intellectual property rights (including Special 301); trade enforcement activities and litigation; internet gambling; South Korean beef trade; and trade preference programs (ANDEAN Trade Preferences, African Growth and Opportunity Act and Generalized System of Preferences). Sean oversaw the USTR media roll outs of trade enforcement action, including the announcement of a World Trade Organization case against China on intellectual property rights, which generated tremendous worldwide attention. From May 2005 to July of 2006 Sean served as the as the Communications Director for the House Republican Conference in the U.S. House of Representatives, the leadership office charged with creating and overseeing communications and messaging. During his time at the Conference he oversaw the training of members of Congress and over 220 press secretaries. Under Sean's leadership, the Conference held the first ever “bloggers row” where members of Congress were able to disseminate the message of the day to large gatherings of political and issue-oriented bloggers. The weekly leadership press conferences were transformed to include message related backdrops and visuals as well as being podcasted to nation wide audience on iTunes. While serving as the Communications Director of the House Budget Committee from January 2003 to May 2005, Sean ensured the committee's defined message was disseminated in all public activities and documents. Additionally, he utilized the committee's digital assets and staff expertise to create a steady stream of documents and web-based resources highlighting current budget and economic news and information. During the 2000 election cycle, Sean served as the Director of Incumbent Retention at the National Republican Congressional Committee where he oversaw the re-election strategies and plans of over 220 members of Congress. He was intimately involved with over 40 “targeted” races, ensuring each campaign had an effective earned and paid media campaign. He monitored advertising, grassroots activities, polling and media buys. At the NRCC he wrote and published the first ever “Incumbent Survival Guide” for members of Congress offering best practices. Sean has also served as the top communicator for the House Government Reform Committee; members of Congress from New Jersey and Florida; and several local and congressional political campaigns. Sean is a commissioned officer in the U.S. Navy (Reserves) and currently is the Director of the Navy Public Affairs Center Atlantic Reserve Unit in Norfolk, Virginia. His insights and activities have earned him recognition and awards from general and flag officers in the US and Sweden. He has served in two joint units and played a leading role as a media planner in joint exercises in Guam; Stuttgart, Germany; Camp Smith, Hawaii; Suffolk, Virginia; and Enkoping, Sweden. Additionally, he has been involved with the media execution of the Department of Defense's 50th Anniversary Air Show Armed Forces Inaugural Committee, ship homecomings and commissionings and coverage of the Navy's role in McMurdo Station, Antarctica. Sean has been a leading source for national and international reporters. He has worked with and been quoted by every major news source including the Washington Post, Wall Street Journal, Financial Times, International Herald Tribune, Jiji News EFE, Reuters, Bloomberg, Associated Press and he has appeared on National Public Radio, BBC Radio, AgriTalk Radio, Marketplace Radio, CNBC, Fox Business Network, Al-Jeezera, Reuters TV and Bloomberg TV. His photographs have appeared in the Washington Post, Daily Oklahoman, All Hands Magazine, Politico and The Hill. Sean has been a featured speaker at the Close-Up Foundation for over fifteen years, previously was elected by his peers in the House of Representatives to serve as the president of the Republican Communications Association and has taught media relations and on-camera skills to US and foreign national government and military officials. He currently serves on the Board of Trustees of the National Defense Committee. National Journal named Sean one of the most influential staffers on Capitol Hill in 2003, and he was profiled in the Almanac of the Unelected in 2006. In 2004, he was elected to represent Virginia in the Electoral College. Sean is a graduate of Connecticut College and currently resides in Alexandria, Virginia with his wife Rebecca.